I’ve used build 10130 for a week and although there are still a lot of bugs, it’s stable and mature enough to be used for tablet testing and to get a feel for whether the features and new user-interface are better or worse than before. I’ve covered the Windows 10 install process for an Intel Atom-based tablet in another post so now it’s time for me to focus on Windows 10 user interface, core features and a few notable Universal Apps from a tablet-users perspective. Assuming Windows 10 is going to be stable then I can confirm that it’s a better OS architecture with a richer feature-set than Windows 8 for tablet users. Ignore the UI for a moment and think about the notifications center, one-touch hotspot, Universal Applications, advanced touch-and-pen friendly browser, a new core app suite, turn-by-turn navigation, improvements in casting and streaming, Office for tablets, finger-free authentication, simple battery saver mode, offline maps, improved data-usage monitoring, battery usage monitoring, much improved app store experience, and Cortana – a way for you to interact with your PC with voice. There’s also a major push for new tablet-focused apps in the Windows Store which includes support for adaptive interfaces (Continuum), new inking APIs and lots of support for turning IOS and Android apps into Windows Store apps. 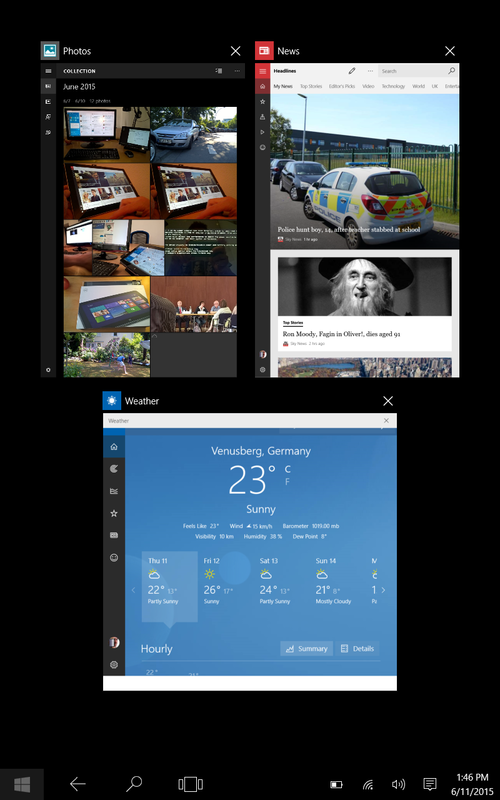 It’s exciting and I’m extremely happy to be testing Windows 10 on three different devices right now. I’ve got it (build 10130) running on a Mini PC (Intel NUC), an 8-inch tablet (Acer W4) and the one I’m using right now, the Surface Pro 3. Floating Universal Apps is the real bonus of Windows 10 in desktop mode and it could be that Windows 7 users start adopting them without even realizing that they’re effectively Windows 8 Store apps. If this adoption happens on a large enough scale then you’ll see apps being ported into the Store from left, right and center. That’s exactly what Microsoft needs. 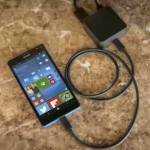 It will help tablets and touchscreen PCs too. As with any new operating system it’s the user interface you see before anything else and from a Windows 7-user perspective I think Microsoft have done enough for it to be accepted. The Start menu is back and the notifications center is a great addition but I haven’t dived too deeply into the desktop yet. It’s working, I’m floating Store apps around across two screens (Displaylink USB adaptors are supported in this build) and I’m happy! My focus here is on Windows 10 Tablet Mode and tablet experience and you’ll find a short overview of some of the issues and advantages in the video I’ve embedded below. Windows 8 tablet users will find it different and there are definitely some issues here that might not get fixed before July 29th. The permanent tablet-mode bottom taskbar is ugly, takes unnecessary space and needs to be auto-hidden as it can be on the desktop. The top-left-positioned ‘burger’ menu is a difficult way to access new applications and swiping actions from the left and right are completely changed. 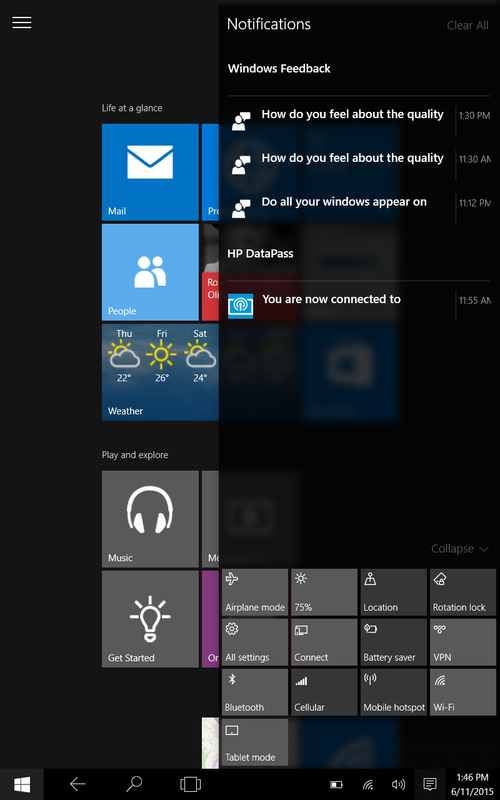 I’m not sure if these actions are better or worse yet because I grew to like the charm bar on Windows 8. The File Explorer listed in the tablet mode menu system is still an old Windows Desktop app and you’ll still see some classic desktop apps as you search for some of the missing settings. 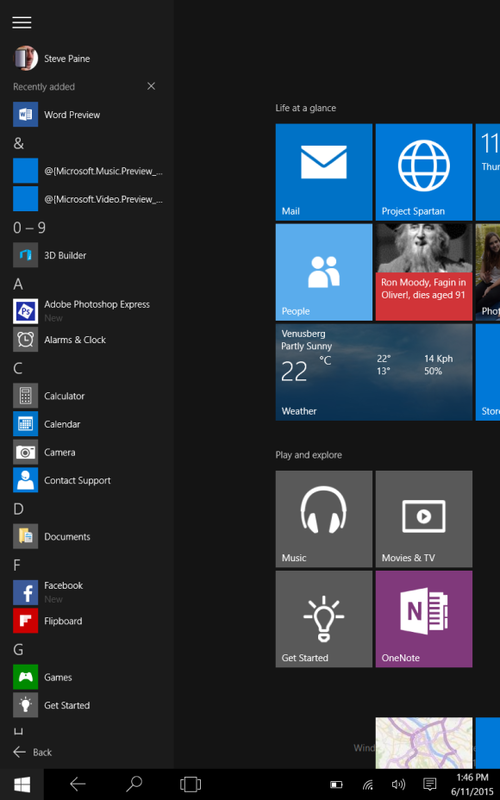 Oh yes, Windows 10 is also a bit ugly. ‘burger’drop-down and permanent tablet-mode taskbar. OneDrive filesystem integration seems to be broken in build 10130. I note that the camera isn’t working on the Acer Iconia Tab W4 in this build. 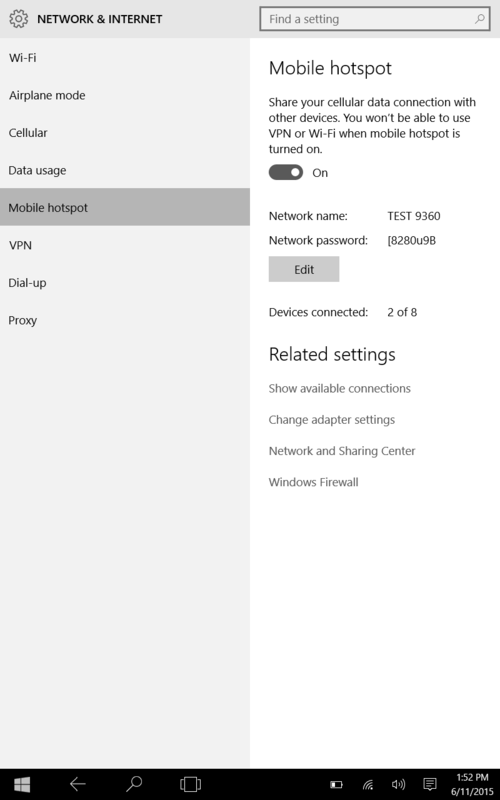 Windows Hello login authentication in shown in the system settings but it’s not yet enabled. If you’ve got an Intel RealSense camera in your laptop or tablet you’ll be able to use face recognition soon. Expect other options to appear here over time. Free Bitlocker for tablets is carried over. Windows Defender is baked into the tablet settings now and I note that Microsoft will re-enabled Defender after a while if you choose to turn it off. That’s good, despite the relatively poor quality of Defender. There are a large number of privacy settings but Windows 10 settings menu brings them all together under one privacy tab. Location, camera, microphone, speech, inking, typing, account, contacts, calendar, messaging , radios and other device access can all be controlled and most of them on a system and app-level basis. I like what Microsoft have done here but i’m not 100% sure if these settings apply to all applications including desktop applications which, if run as admin, could bypass these privacy settings. I’ll do more research here. In general you’ll get a more secure, more efficient Windows experience if you stay within the Store apps but there’s no easy way to tell what is and isn’t being controlled by the ‘RT’ subsystem and what’s operating outside it. Again, i’d like to see a ‘disable desktop operations’ option on Windows 10 as a screen-on variant of connected standby. On connected standby I note that you can now disable CS/InstantGo from having network access. There’s no easy way to disable CS/InstantGo. I’ve completed a suite of battery drain measurements on the Surface Pro 3 and compared them with the results I had under Windows 8 and it looks comparable. I saw a slight increase in video playback battery drain but that could be due to un-optimized video or audio drivers. I also saw a decrease in browsing battery drain when using Edge. Compared to Chrome it looks to be 20% more efficient when browsing mixed media and over 50% more efficient when watching YouTube videos. Chrome was always bad at efficient YouTube playback though so this was expected. There’s a new battery saver switch in the settings which turns off all background access for apps. This was possible in Windows 8 too but it was difficult to find. You can also disable notifications in battery saver mode and set it to automatically enable at a certain battery level. The improved per-app battery usage reporting is nice to see but the definition of the figures isn’t clear enough. There’s no graph of battery life history either. Powercfg reports show that connected standby is not working well on the Acer Iconia Tab W4 yet although I haven’t tested standby with WiFi disabled. 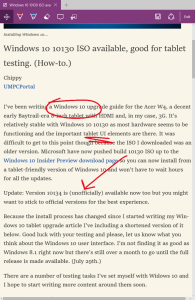 Edge browser annotations in Reader mode. I’ll dive a bit more deeply into this in another post but so far the new browser looks good and performs well on sites that work. In tests against Chrome it rendered just as quickly, beat it on a Sunspider test and lagged only slightly on Octane and Peacekeeper tests. I experienced one crash during testing and a number of problems with websites – Google Plus and Google Music being two examples. 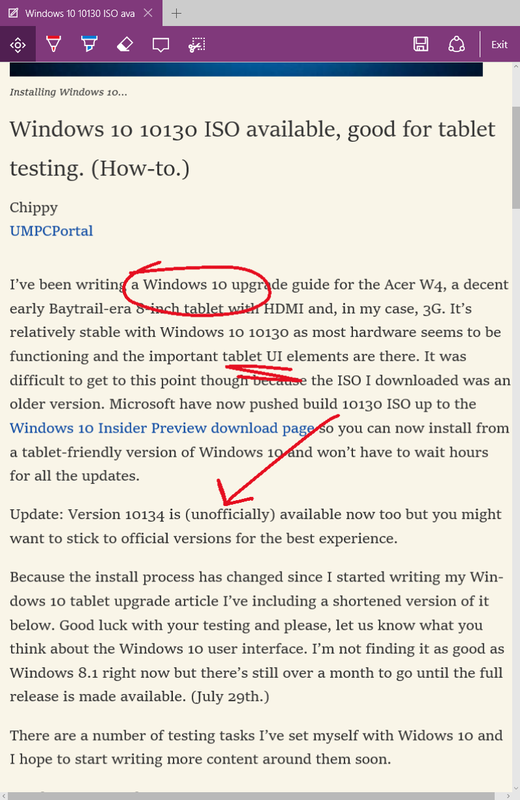 Reader mode, a feature already included in the IE app in Windows 8, has been enhanced for Edge and the fact that you can annotate in this mode is going to be great for students. The reading list feature is good too although I’m a bit confused at the moment as to whether it saves pages for offline use and whether it syncs with the Reading List app and then across devices that use it. Bookmarking works relatively well but it didn’t sync across my two devices and password saving is somehow disabled on my build. One of the nice features of the Acer Iconia W4 is that it has GNSS (GPS) and 3G which makes it interesting when it comes to traveling. 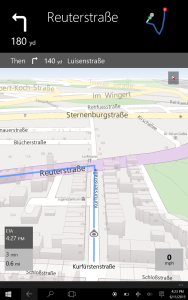 The new Microsoft Maps app for Windows 10 now has offline map capability and can do turn-by-turn voice-led instructions. Traffic information and speed warnings are also included which makes an 8-inch Windows tablet way more useful in the car than it used to be…as long as you have GPS/GNSS. Not many tablets do but expect to see a higher percentage including it as Maps and Cortana relay on it. I’m happy to report that 3G is working, also in InstantGo mode (standby), and the hotspot feature is easy to set up. After just a week of testing Windows 10 on tablets I’m happy to report that there’s a lot of added value over what was available in Windows 8 and that, even if the UI issues don’t get fixed, you should still consider Windows 10 as a flexible mobile computing solution. More important than the UI issues are the stability issues and it’s important that Microsoft have that at the top of their priority list. No doubt there’ll be a big fuss and a number of articles from people complaining about the UI but from what I’ve seen, Windows 10 is going to be a worthwhile upgrade for tablets as long as driver support is 100%. If Universal Apps start rolling-in then the experience will get even better over time. I’ve fed back my thoughts to Microsoft via the Uservoice platform and I hope you do to. 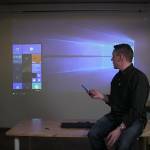 Video: Windows 10 on an 8-inch tablet. Note: Build 10130 does not work on Surface 3 due to lack of support for features in Atom X7. Microsoft have confirmed that this will be fixed. .1 UI its damn good. 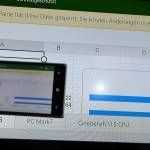 I’m going to skip 10 on my tablets as I believe MS wont work on touch UI till the next version. Touch is part of every Universal Application. There are currently a few UI issues that I really think will get fixed (the hamburger menu for example) so I encourage you to keep watching. Excellent rundown/analysis. I’ll be rereading this a few times. I agree the taskbar should have a separate auto hide option when in tablet mode and should be displayed with a swipe from bottom/up gesture .. just like is available on Windows Phone without capacitive buttons. But I also don’t want it to resize the app(s) in focus but let the taskbar float over the app bottom. That is not how maximized applications have historically worked with taskbar auto hide. Currently I see a lot of UI inconsistency and I expect it will take more than a few months to iron out. So, I’m torn. Hopefully we’ll see a Windows 10.1, with a better tablet interface. Sorry for being off topic. I want to get a Windows 8 tablet which could play videos on living room tv without stutter. I have a 15.5 inch Lenovo which does a great job but is too big for everyday use. So I bought a $100 Chuwi Vi8 tablet and it does play content mostly okay through my ActionTec ScreenBeam Mini2 WIDI device but there is still too much stutter in YouTube/Amazon videos in both Windows and Android installs on Chuwi. I presume either the processor is too slow or wifi antenna not good. So what tablet could do the job? I prefer tablet only– 8-11 inch sizes. I am looking into Acer Aspire Switch 11 but don’t need the keyboard. I am thinking of spending no more than $350–it will be basically a media playing device. Heya, no chippy here but have u considered one of those tablets with HDMI output? Thanks. I do have a 15 foot long HDMI cable from the couch to the TV and that does work perfectly fine. However, I want a cordless solution and currently a purchase of ActionTec Mini has made the experience near flaw less when using the big Lenovo. Speaking of ActionTec I decided to try Miracast on my Google Nexus 7 (the second version) and that works fine on YouTube with Miracast; Nexus 7 has a lot of horsepower which poor Chuwi doesn’t have. But I don’t want crippled solutions like iOS, Android or Windows RT–I want to be able to play any format and only a full Windows enables that. And hence I want to get a powerful-enough Windows tablet. After my post above, I did some more search and I think Acer Aspire Switch 11 V should do the job with its Core M processor, its form factor (the Stand mode) and long battery life… Or something similar. I am a little lost about what will happen to RT ,I use a Nokia 2520 for light stuff, and found that it was better than ,a Samsung 10 windows tablet and a hp Omni. 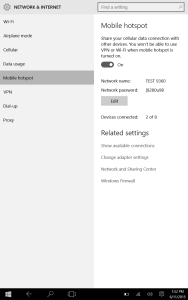 Will I just be left with windows rt 8.1 as I have now or will I down load windows module ( phone 10). Sorry that should be windows mobile, should also say I really like windows RT,but some of the new 10 features such as off line maps would be good . Joe. RT devices won’t get an upgrade to Windows 10 so you are stuck with 8.1. 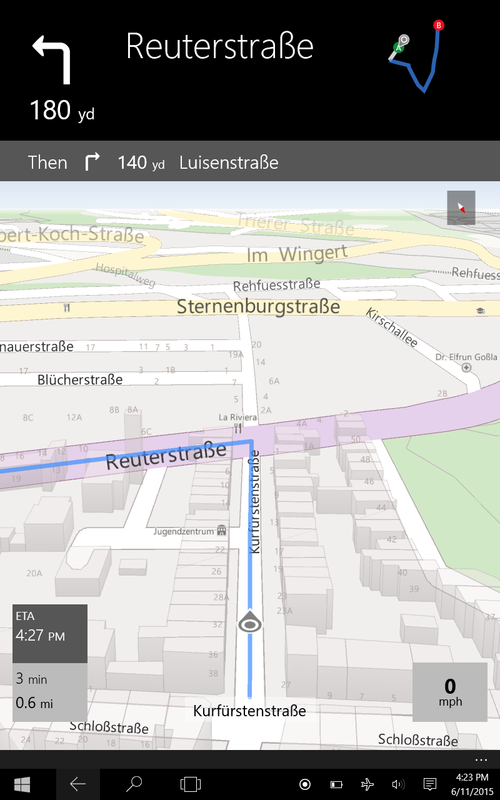 I agree that offline maps would be great for a light 10-inch Windows 10 Mobile tablet but it might be a while before we see those products. @Meengla Yip. Wait for a while. From what I’ve seen of Windows casting and streaming improvements in Windows 10 it makes me think that Microsoft will release a headless Windows 10 stick soon. The DIAL protocol is supported along with DNLA and Miracast. Alternatively, an Intel NUC with the built-in IR reciever and Openelec? @Chippy, ok, I will wait. thx! I have been using W10 on a number of VirtualBox images. It looks and works a bit better than W8 but its not very stable so far. 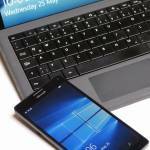 Do you think touch is needed for Windows 10? I’ve been considering getting the Asus Zenbook UX305 (slow Core M processor, but blessedly silent) but the US$699 model doesn’t come with a touchscreen. « IOS 9 includes windows. It’s iMetro!